Everywhere i turn lately there is someone talking about vacation bible school. either their kids or grandkids are going, or they are helping run it at their church. i am not a religious person. if i had to label myself i would probably go with agnostic (agnostic vs. atheist). but i do fondly remember those wonderful fun filled weeks of VBS as a kid. the one i went to most often was at Ohlman Church about 4 miles or so down the road from where i lived (according to Google Maps). the couple that ran our local gas station and store were parishioners there and were more than happy to take me along with them to attend VBS even though i didn’t actually go to church there. There was an entire process involved. 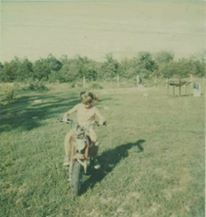 my family lived down a mile long dirt road so to make it easier for Mr & Mrs Fields, i would hop on my trusty motorcycle and head up to their house so they didn’t have to go out of their way to pick me up. I can still remember some of the things i made there, one year i made a thing for my dad to hang on the wall, it was a circle cut from a tree trunk and then we used Mod Podge to put a picture on, for my dad i put a picture of a big tom turkey. i wonder i they still have that thing.. i will have to ask. Mr and Mrs Fields tending the store. remember when someone came out to fill your car for you? he even filled my motorcycle tank, and took all the pennies i had scraped up to pay with. and that church every time i go home to visit, and oh, the memories…. and let me tell you, thinking about VBS actually makes me ponder going 🙂 but i am pretty sure they wouldn’t let me have near as much fun now that i am a grown up. Man those pic bring back some memories. See the price on the pump. 5 dollars for 5.5 gallons! Thanks for the pics Tara ! That is not an easy question to answer, i don’t think that there was any one thing, my parents were not church goers, and neither were my grandparents, any exposure to religion was through other family members and while i went to church and of course to VBS it was never something i felt strongly about. my best friend died when i was 11 and i had watched her suffer with cancer for a long time. there was a lot of ‘god needed her with him’ explanations. i think that was probably when i fell hard off the church road. what could god possibly need with a 10 year old girl if he was so powerful and awesome, and more importantly why let her, her family and her friends suffer for so long? since then i have seen no compelling proof that there is a god, or if there is that he is this nice guy so many people talk about. on the other hand there are so many people who do believe that i am left with a reasonable doubt in my mind and maybe i am wrong and they are right, but unless the christian god, or Thor or some other deity walks up and introduces themselves, i will likely remain agnostic. Don’t stop seeking the Truth. It is the only thing that will set you free. i don’t think i would say i am still searching, that makes it sound like i am going out of my way to be convinced that there is something out there and that is not the case. if it falls in my lap fine, but until that happens i am perfectly happy being agnostic. i don’t’ worry that i won’t go to heaven or will go to hell (which let’s be honest here, is where i would go at this point if that were a thing) 🙂 i don’t worry if i am pleasing some higher power in my actions, i worry that i am pleasing my mom and dad, and i am not doing things that would embarrass my grandparents (technically gives me quite a bit of leeway). have I learned good things when I did go to church, of course I did. the golden rule is ‘do unto others as you would have them do unto you’ and that is what I strive for, but not for some higher purpose, simply because to me, that is just the way everyone should be. and don’t get me wrong, i know many more Christians than ‘christians’ but that is mainly because I don’t keep the ones that don’t live by the rules that simply make you a good person in my life very long.